With its nifty interface, preset patterns and progressions, and linked modules, Captain Plugins is an invaluable compositional aid. No note editing at the time of writing. From the makers of the Mixed In Key harmonic DJ mixing software, Captain Plugins is a bundle of three instrument/MIDI FX plugins (VST/AU) for designing MIDI chord progressions (Captain Chords), basslines (Captain Deep) and leads (Captain Melody), plus a fourth (Captain Play) that self-contains the other three’s ‘live’ Play mode. Aimed at dance and pop producers, it claims to be able to guide anyone - regardless of theory skills - all the way to finished compositions via a friendly, easy-to-use interface. As the ‘source’ plugin on which the others are based, Captain Chords is the main attraction, so that’ll be the focus of our review. When you launch Captain Chords, you’re first asked to choose a Key and Scale in which to start your composition, or hit the Randomize button to have the gods make the choice for you. The Scale list includes all the usual majors and minors (blues, pentatonic, etc), as well as modes (Locrian, Dorian, etc). Selection made, the main interface opens with your one-bar-long, three-note chord shown in the Verse tab’s piano roll display. The adjacent Pre-Chorus, Chorus and Drop tabs each hold their own progressions (the names are purely for reference), for a song’s-worth of sequences. Starting playback loops the chord, triggering one of 150+ onboard sampled instruments – strings, plucks, keys, guitars, etc – complete with reverb, delay and filter effects. The sounds are good, but you will, naturally, want to route Chords to your own synths and samplers regardless. 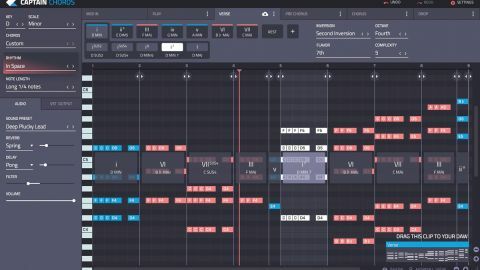 This is done using your DAW’s MIDI routing system with the VST version, while Logic users simply load the AU plugin in front of their instrument of choice as a MIDI FX. Clicking the + button to the right of the chord duplicates it into the next one-bar block, where it’s edited using the two rows of buttons above. The top row contains every chord in the chosen key, while the bottom row switches to show the various voicings for the selected chord. You can also enter a rest, or type in a custom chord. Dragging a chord’s boundary marker resizes it, and chords can be split in two at a click, making it a snap to work in short ‘passing’ chords. The base Key and Scale are editable at any time, too, of course, automatically reconfiguring all the chords in the progression to match. By default, chords are solid, legato blocks, but they can be turned into more temporally interesting passages using the Rhythm and Note Length menus. Built on the foundations of Captain Chords, Captain Deep and Captain Melody use the same underlying processes to generate bass and lead/ melodic lines. But what’s really clever is that Deep and Melody are slaves to Chords, automatically updating their monophonic lines to follow the latter’s progressions as you tweak them in real time. It’s like magic! Being monophonic, as you’d expect, Deep and Melody lose the chord selection, voicing and inversion controls, but keep the Octave and, in Melody’s case, Note Length menus. They also both draw on the same library of Rhythm patterns as Captain Chords. Captain Melody takes its onboard sounds from Chords’ library, while Deep features 60 exclusive bass sounds alongside Chords’ ‘Plucks’. The parameters diverge with Deep’s Shape options, and Melody’s Tension and Pattern menus. Shape determines the way in which Deep’s bassline relates to Chords’ progression (‘Follow the chords’, ‘Opposite movement’, etc). Tension controls how closely Melody adheres to the notes of the key or chords, and thus how much dissonance is introduced; and Pattern, which works in tandem with the Rhythm menu, reorders the notes with 106 arpeggiations and sequences. The first houses a huge list of preset rhythmic patterns, most of a decidedly dance music bent; the second offers quarter- notes, and regular and dotted eighth-notes alongside the default legato option. As powerful as these two systems are, they’d be much more so if they could be applied per-chord rather than only globally, as is currently the case. With a chord selected, various individually editable parameters do become accessible, however. Complexity adds bass notes to the chord when raised from its default value of 4 (up to a maximum of 7), and thins it out at the top when lowered. Inversion options comprise the ‘Default’ triad, and ‘First’ and ‘Second’, as well as the default ‘Minimize Leap’, which intelligently sets the optimal voice leading for the chord and all those following it. Octave shifts the whole chord up and down the keyboard, and Flavor lets you add extra notes - the 6th, 7th, 9th, 11th and/or 13th. The interface is freely resizable, and various piano roll folding options are available, so keeping everything in view as your chords start to vary in height is never a problem. The process of creating effective chord progressions in Captain Chords by adding, defining and resizing blocks really couldn’t be more intuitive or fun. Nonetheless, you can instead take a shortcut by loading one of 68 pre- designed minor or 69 major progressions from the Chords menu, for use as is or as a starting point for customisation. Said customisations can’t be added to the menu, alas, but can be stored as proprietary files. Finally, with your progression complete, exporting it to the host DAW is as easy as dragging the thumbnail graphic from the bottom right corner to a MIDI track. As an alternative to all of that, though, if you’d rather get ‘live and direct’ with your composition, in the Play tab you can jam out chord progressions on your QWERTY keyboard, recording them for export as MIDI clips (but not, disappointingly, for transfer to the piano roll for further tweaking). This mode is also available discretely as the Captain Play plugin. Captain Plugins achieves its goal of enabling anyone to put together fully-realised compositional structures in absolute style. The interface is slick and fluid, the onboard sounds are more than good enough for auditioning purposes, and seeing and hearing Deep and Melody follow changes made in Chords never gets old. Some knowledge of music theory helps, but it’s in no way essential - just jamming around in Play mode or trying out random chord sequences in the piano roll are perfectly viable approaches. The obvious issue with the three main plugins right now is that you’re limited to their (very extensive) prescribed harmonic and rhythmic shapes, with no way to manually move individual notes. Trying to do so, however, pops up a dialog stating that “MIDI editing is coming soon”, so we very much look forward to that. Roadmap aside, even in its current form, Captain Plugins is a highly productive harmonic and melodic toolkit for experienced musicians and total newcomers to composition alike.